Mt Buller sets the scene for the next round of the Asia-Pacific Enduro Series this weekend, across 1-2 December. The event has attracted world class competition, across both the men’s and women’s fields, including the current World Champion Sam Hill, UCI 2017 MTB Enduro Champion Gabriel III Amigo from the Philippines, Australia’s Enduro specialist Rowena Fry and New Zealand’s top rider Rae Morrison. In addition to the deep field of elite action, Mt Buller will play host to a multitude of inspiring riders across various categories including an exclusive e-bike class, challenge category, masters, U23 and junior men’s and women’s fields. The Asia-Pacific Series enables riders to gain world ranking points into the 2019 Enduro World Series (EWS) and Mt Buller is the final race for participants to qualify for the EWS Asia-Pacific main event in March, in Derby, Tasmania. Riders must pre-qualify and secure a spot on the EWS reserved entry List to be eligible to race. In the Asia-Pacific series the top three riders in each category, per event, progress onto the Enduro World Series reserve listing. The motivation to qualify for the showdown in Derby, means that the podium positions up for grabs will be hotly contested in Mt Buller and gritty performances will be certain. Sam Hill, donning the 2019 Enduro World Series Champion crown for a second time in Finale Italy, is set to tackle the race format in Mt Buller, after claiming the champion title in Derby earlier, across the gruelling enduro format, in November. Hill, a former professional downhill racer, remains one of the most exciting athletes on the circuit. The flat pedal rider, from Western Australia, will once again showcase his roaring talent and exceptional form in Victoria this weekend. Philippines fieriest mountain bike racer and UCI 2017 MTB Enduro Champion Gabriel III Amigo is thrilled to be down-under to race and lining up on Sunday. “I am pretty sure the trails will be fun and challenging!” Amigo said. Australia’s Josh Carlson is making a comeback to the scene after injury and will be a rider to watch on Sunday. “I’m really excited to get racing this weekend at Mt Buller. I also enjoy coming down and riding around down there and I haven't raced at Buller in a long time! “After the 'test event' at Derby to see if my body and injuries had healed, I feel a lot more confident heading into this weekend’s race. I can’t say that I am in wicked form at the moment but I’m happy to be riding my bike and to be 100% healthy again,” said Carlson. After his race debut in Derby recently, the experienced rider is looking forward to racing the established trail network, known as the Mt Buller Bike Park. “With such a deep field of riders in Derby, I am expecting the racing to be just as tightly contested, if not even more so! The trails around Mt Buller are energy zapping and tricky which will make for a tough day of racing. Can’t wait!” Carlson added. Tasmanian athlete Rowena Fry is on a 2018 winning streak, dominating the elite women’s Enduro field in Australia and the main contender leading into the women’s race on Sunday. “I am looking forward to the third and final round of the Shimano Enduro Series. I’ve only ever ridden XC at Mt Buller and that was the same 6km loop repeatedly so I’m really looking forward to riding the other variety of trails people love at Buller,” Fry said. Fry recently took out the first round of the Shimano Enduro Tour on the Gold Coast, claimed victory in the National Round in Adelaide and stomped the field in the Derby Enduro race by taking the win. “Hopefully I can carry the good form from the awesome Derby round into this second EWS Asia Pacific Series race. “It’s really great to see top New Zealander Rae Morrison join the field. She will test us Aussies out and is a consistent racer on the EWS circuit. It’s been solid racing between Em Parkes and myself all series so I expect another close battle with her as well,” added Fry. Back on the scene in Mt Buller, Australia’s Emily Parkes will certainly be one to watch in the women’s race. “Since the first round my fitness has slowly been on the rise and I'm looking forward to a fun weekend in Buller!” said Parkes. The highly anticipated event in Mt Buller will be the final round of the Shimano Enduro Tour here in Australia. Shimano Australia are thrilled to partner with the Asia-Pacific Series. “Shimano Australia is excited to see the progression of Enduro in the local market driven by success of the Enduro World Series. 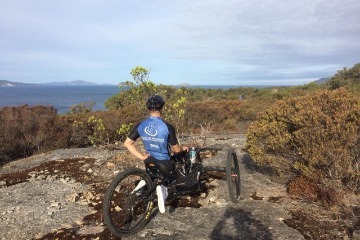 With the Shimano Enduro Tour Australian riders have the opportunity not only to progress to the next level but also to enjoy racing in some of the best locations in the country. “With Event Management Solutions (EMS) Australia, we have a partner who are able to deliver a world class experience for all riders. “Good luck to all riders racing, we look forward to seeing you in Mt Buller for the final round,” said Shimano Australia Brand Manager Toby Shingleton. With around 200 competitors, Mt Buller, Victoria will be transformed into an energetic hub of mountain biking activity. The event is free to spectators with plenty of course vantage points to catch the action. There’s also a bevy of fun, family friendly activities on offer throughout the town. Visit the Mt Buller website for more information.